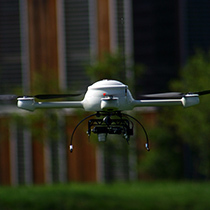 The Lakeside Labs project cDrones aims at advancing the state-of-the-art in the domain of aerial imaging with small unmanned aerial vehicles (microdrones). We develop algorithms for mission planning and and sensor data processing. Although the developed technology should be of general applicability, we focus on microdrones for fire rescue scenarios. At Austria’s long night of research on November 8, 2008, several night flights were presented to a large audience. They awarded the team with the second price out of 55 competitors in Klagenfurt. The funded project started officially on January 1, 2009.